Smoking, in and of itself, is pretty gross. It’s addictive, expensive and smelly. If it doesn’t eventually kill you, the guilt of knowing that it’s supposed to likely will. 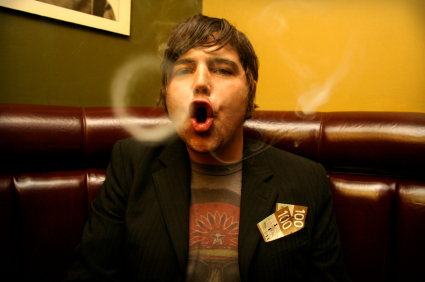 If you are going to smoke, however, being able to blow smoke rings is awesome! You’re basically doing magic tricks with your lips. The key here is to be casual about it. Just spit out a smokey “O” and let the your onlookers coo in delight and approval. Be the Dragon! Awe those villagers with your mighty fire mouth! This entry was posted on April 18, 2010 at 11:24 pm and is filed under skills. You can follow any responses to this entry through the RSS 2.0 feed. You can leave a response, or trackback from your own site. If you flick the bottom it looks like a bum….That’s kind of juvenile though.